Lease abandonment occurs when a tenant leaves the rental unit for a significant period of time without informing the landlord. A home that is left unattended for some time may need repair and have security issues or other problems that can cause issues with both landlord and tenant. To regain possession of the home, a landlord must submit advance notice in writing as well as other proofs of abandonment. 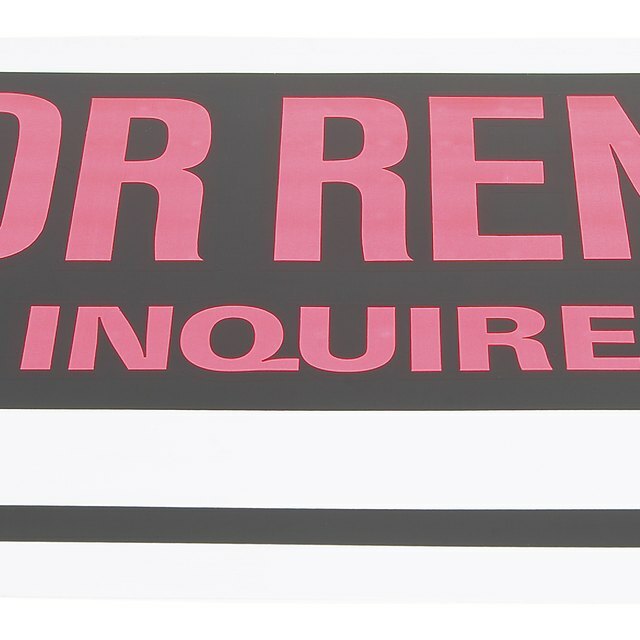 The landlord must determine if the rental unit has been completely abandoned. The tenant is obligated to inform the landlord about long absences from the home. If she abandons the property without notice, the landlord needs to prepare documentation proving why he feels the home is abandoned. A cessation in rent payments and notice of utilities shutdown are valid forms of supporting documentation. The landlord retains the same right of entry that he had while the tenant was in residence. He must provide advance written notice before entering the home. Other signs of abandonment, such as electricity or water shut-off, may be more easily noticed once the landlord actually enters the home. The tenant may have also moved all of her belongings out of the home. The landlord must serve an abandonment notice on the property before she regains full legal possession. If the lease agreement does not specifically say how long a property needs to be unoccupied before it is considered abandoned, state statutes apply. The landlord must prepare an abandonment notice and send it to any addresses he has on file with the tenant. This notice informs the tenant that the landlord considers the property to be abandoned, with no indication that the tenant is planning on returning. This notice should provide a reasonable amount of time for the tenant to respond to the notice. The definition of reasonable is dependent on your state, but two weeks is average. If the tenant responds to the notice, she can tell the landlord whether or not she intends to come back, and what to do with any personal possessions. If back rent is an issue, the landlord can find out whether the tenant intends to pay the rent owed. If the tenant returns to a supposedly abandoned property and does not pay or make arrangements to pay the back rent, the landlord must go through the formal eviction process for nonpayment. If the tenant does not respond to an abandonment notice, the tenant loses the right of possession of the rental unit. The landlord does not have to file for a formal eviction, due to the abandonment clauses in the lease agreement or landlord and tenant laws of the state. You may need to file in court if the tenant owes back rent, however, in order to get a judgment against him. Once the landlord has possession of the property returned to him, whether by the tenant indicating he is not coming back or by not responding to the notice, the landlord is able to rent the apartment out, enter the apartment at will and change the locks once it is back in his possession. Personal belongings need to be stored for a certain period of time, also dependent on the state you live in. If the tenant owes back rent, you can file a lawsuit in court to attempt to recover the money. California Courts: What If the Tenant Seems to Have Moved Out?